THE sound of bombs is deafening and the green fields of northern France are now stained with the blood of thousands of brave soldiers. From the mass grave of the Somme battlefield to the carnage of Ypres’ no man’s land, the death toll is rising daily as Europe finds itself locked in the bitter conflict of the First World War. In the trenches, men as young as 16 prepare for the latest push over the top – another advance that will lead to many of their deaths. And in a disused Abbey a few miles from the war zone, a group of women volunteers struggle to tend to the massive number of casualties. 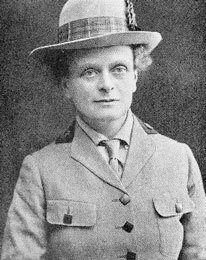 Alongside their founder – Dr Elsie Inglis – these members of the Scottish Women’s Hospitals Service are faced with a daily routine of blood, suffering and death as they strive to keep alive the young soldiers cut down by gunfire. But although their base at Royaumont Abbey – around 45km from Paris – was seen as one of the most important centres for medical aid during the war, many of the stories about how these women transformed the damp, disused church into a groundbreaking field hospital have remained unknown and unrecognised over the past 80 years. While the troops who risked their lives are remembered and honoured, the women doctors, nurses and orderlies who put themselves in the firing line have been all but forgotten. Now there is a campaign to erect a statue in Edinburgh to Inglis and the members of the Scottish Women’s Hospitals Service so their work will be permanently remembered. Here, we profile three women from Edinburgh and Lothian who risked their lives.